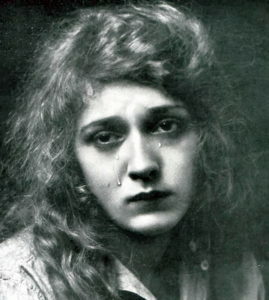 This behind the scenes story on how silent picture actresses produce tears on cue by Gordon Gassaway appeared in PhotoPlay magazine in September of 1915. Ever since a certain famous director filmed a certain famous star with real tears coursing down her cheeks and splashing mournfully on a ham sandwich she happened to be holding in her hand out of the vision of the curious camera lens, tears have been the rage. No self-respecting five-reeler appears without them. A feature film, without a close-up on tearful thoughts, is like Southern California without sunshine, almost impossible and dour to contemplate. “Register tears 1” directors are shouting at our best known film queens, and the same BKDFQ’s are promptly registering the same in a space of a few minutes or a few hours or a few seconds. It took Blanche Sweet twenty-four hours, once, to “get tears” — but that is another story. How do they do it? Is it an easier thing to do for the camera than for an audience in a theater? What does an actress think about while she looks so sad? These questions and more are best answered by the moving-picture stars themselves. Some of them are the champion weepers of the film world — not because they are sad by nature, no, but because they are super emotional, perhaps — and to these I turned for a woman’s most sacred thoughts — the things she cries about! 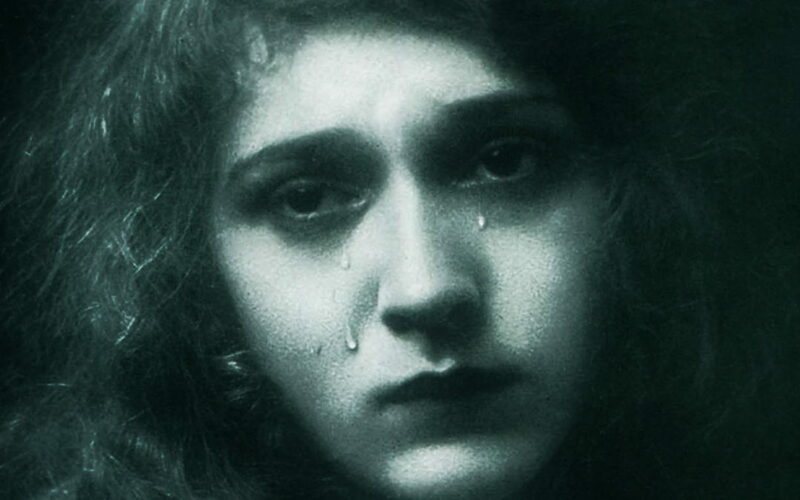 Mary Pickford believes that weeping is purely and simply a part of an actress’ calling. I began my painless extraction interview plan on Mary Alden, at David Griffith’s picture shop in Hollywood, with a phrase which was meant to sound something like this: “Oh, why do you weep, my pretty maid?” — thinking, of course, that the subject was (quite delicate and required arbitration. Not at all. 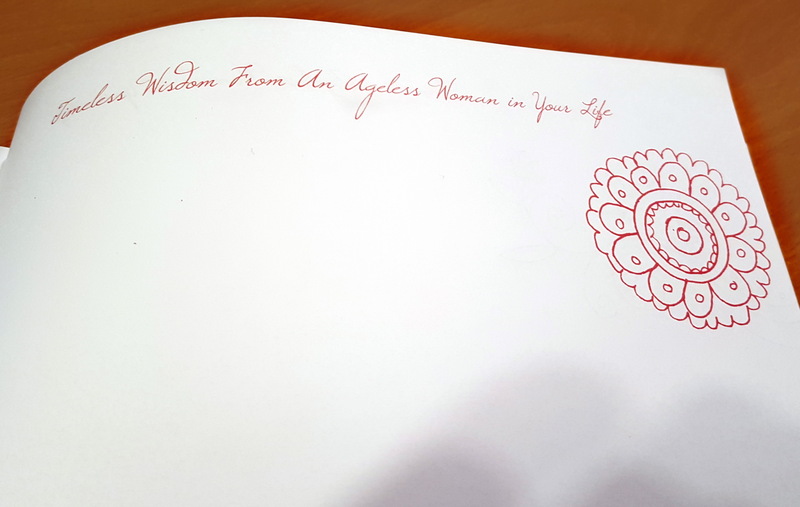 Mary Alden is one of those who have taken time to give subjects like “tears and why” and “how to be happy though hungry” some serious consideration. In other words, she is a psychologist and it shows in her working. Which proves, moreover, that brains are not fatal to talent, and that a few more in the heads of the World’s Most Beautiful Women would make Benedicts of us all! Into her eyes came a far-away look, as though she were witnessing a vision cut-in of the death of a young and harmless child. She seemed to be going gently but firmly into a trance. I was alarmed and took her by the arm. I was not ready for tears. I had not wanted to see tears — I had merely meant to ask about the things, and not to take part in any lachrymose demonstration there in front of several hundred extra men and women. I think I shook her. just a little. She came back to us from that cut-in vision of the young and harmless, and started to talk. 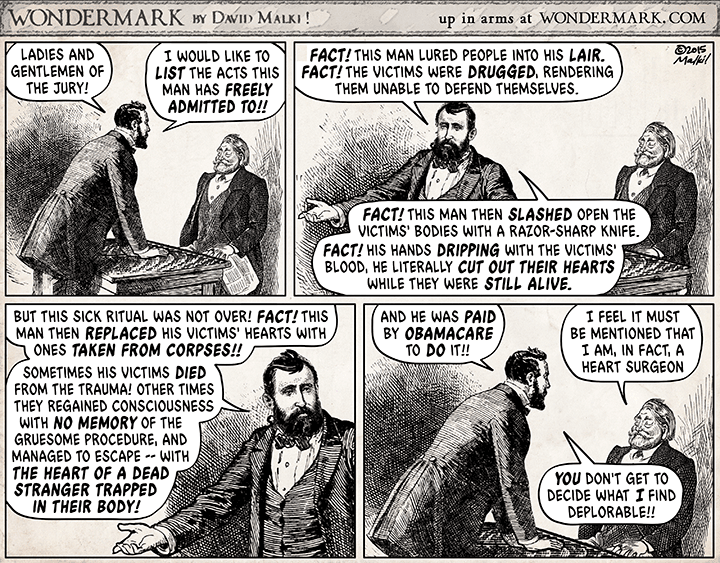 David Malki’s delightfully whimsically twisted WONDERMARK: An Illustrated Jocularity webcomic is something I look forward to every week. 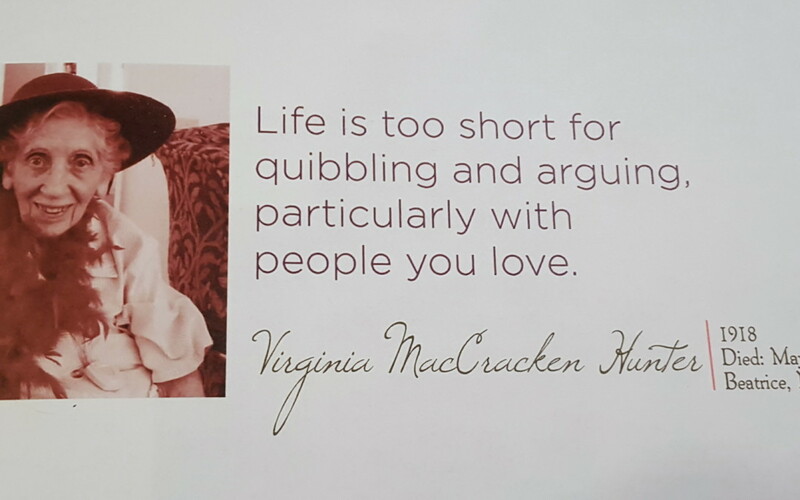 Somewhat less known, are the occasional blog posts he throws online in a series called: True Stuff From Old Books. 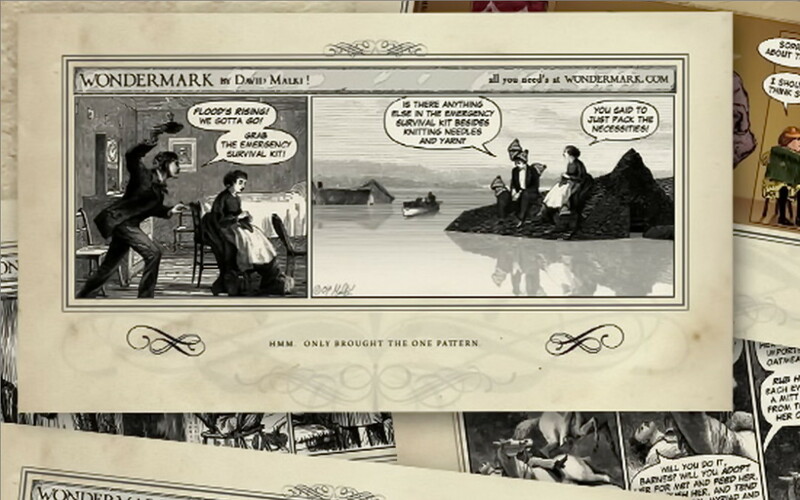 These posts are rambling and informative explorations on some topic that has caught Malki’s attention. It is that kind of informal web content that inspired me to start this site. 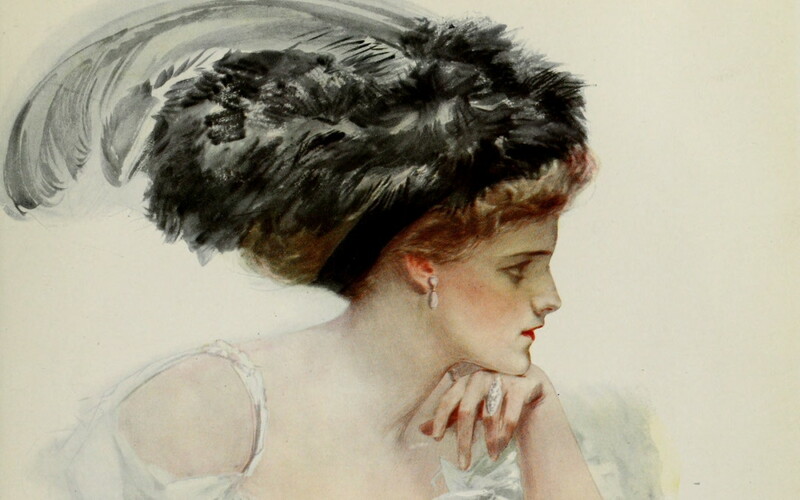 Harrison Fisher: What Is a Pretty Girl? Illustrator Harrison Fisher was born in Brooklyn on July 27th, 1875. His great-grandfather, grandfather and father were all artists. He was first taught to draw by his father, the landscape painter Hugh Antoine Fisher, at the age 6 when the family moved from New York to California in 1881. 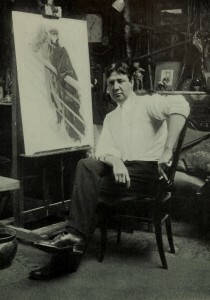 Harrison later studied at the San Francisco Art Association (later named the Mark Hopkins Institute of Art.) By age 16, he was earning money selling his illustrations free-lance. By the turn of the century he has a solid reputation as a talented illustrator. 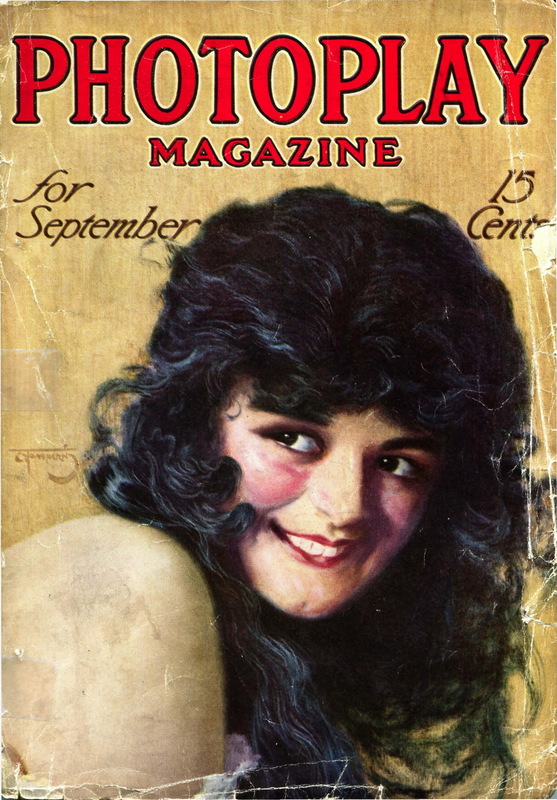 During the early 20th century work appeared on over 80 covers of the Saturday Evening Post. He was best known for his easily recognized graceful drawings of vibrant young women. Many appeared on the covers of Cosmopolitan magazine. 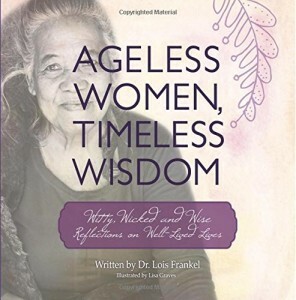 His “Fisher Girl” and “American Girl“ ideals became the epitome of beauty in America during the 10’s and 20’s. From 1913 till his death in 1934, he created almost every cover for Cosmopolitan magazine. Fisher died in 1934 at 59 years old. 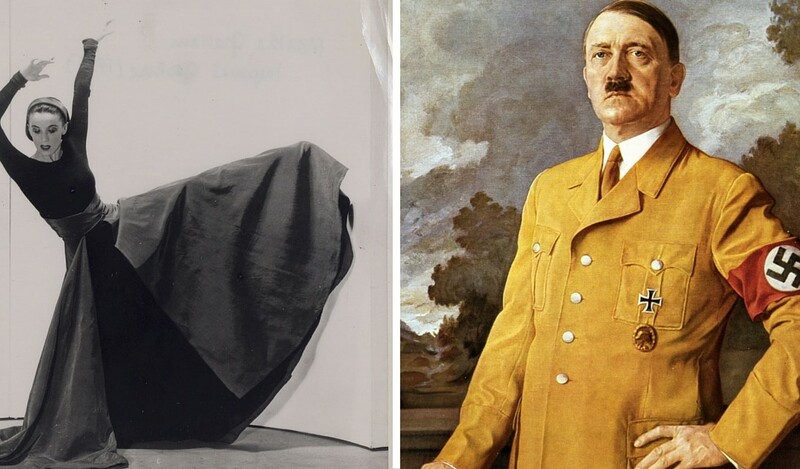 After his death, one of his relatives took a select few of his paintings, and burnt the rest. Over 800 Harrison Fisher originals were lost. A century ago this month he published a three-part series on beauty that was syndicated in newspapers around the country. The article below was #2 in the series. What Is a Pretty Girl? A great many persons don’t know how to judge a pretty girl. The reason is that they have a mind of the microscopic kind, that seeks for blemishes. The only way to judge whether a girl is beautiful, or possesses that lesser degree of beauty which is prettiness, is, first, whether her face is balanced; second, whether hr figure is symmetrical. Personally, I am opposed to accepting the canons of the ancient Greeks. I have to be convinced that they had any more authority for saying that a body should be so long, shoulders so wide, a foot so broad, than have we moderns. The truth is some of the works of the old masters were, so far as the subjects were concerned, atrocious. I have never seen uglier women than those whose portraits were done by some of the masters. “Smoked hams,” my father has called them as we made our way down a gallery corridor inspecting some works of art. In other words, I am of the opinion that it is possible for an artist of today to have too much reverence for the old masters. For instance, I say very frankly that think the Mona Lisa ugly. It is a form of snobbery that found expression in the widespread professed admiration for that picture. The Mona Lisa’s long nose and sly smile are not beautiful. They are unpleasantly homely. But because the word went around that Mona Lisa was the work of a master everyone professed to intensely admire it. It is not fair to measure a modern girl by the old standards. We should judge her by whether the impression made by her face is that of harmony, of balance. Personally, I admire the tilted nose, and I have a right to my opinion. The personal element enters more or less into every judgment of beauty. To my mind the nose that turns up slightly at the tip gives piquancy to the face. Accordingly, until I change my mind, my pictures of girls will have that characteristic. And a face is not inharmonious because it possesses that kind of a nose, unless all the other features are aquiline and so do not match. It does not matter what the type of face, whether oval, aquiline, or nearly round; if it gives the impression of balance, of harmony, it should be attractive. If one feature is out of harmony, if it spoils the balance, it will miss beauty. And so of the figure, it may be svelte or plump, tall or short. It does matter what the plan of its building provided it has correct proportions. 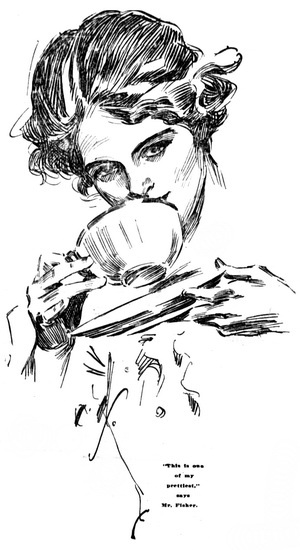 Four gorgeously illustrated collections of Harrison Fisher’s work are available through the Internet Archive. They are American Beauties (1909), Harrison Fisher’s American Girls in Miniature (1912), Fair Americans (1911), and A Dream of Fair Women (1907). 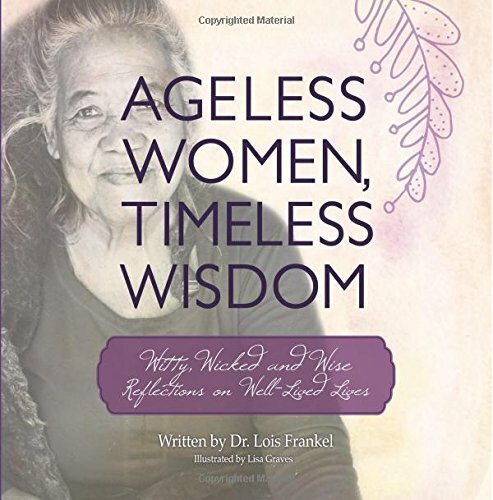 The illustrations below are selected from among those four books. There are more of them posted on the Words From Us Facebook page.